The economic and political changes characterising contemporary urbanisation have generated unjust conceptions and configurations of urban space that, in turn, have sparked off unusual forms of activism. All over the world, heterogeneous groups of citizens have imagined and experimented with new collective actions to counter urban transformations producing social segregation, expulsions, erasure of public spaces and environmental destruction. However, the impact of these experiments on the production of more just forms of urbanisation is a contested issue. Following a line of thinking that grasps the sense of such experiences, rather than their greater or lesser capacity to change the course of events, this paper compares and debates two cases of urban activism occurred in the Apulia Region (Italy). The case studies are analysed with a focus on the narratives concerning the sense and feeling of injustice circulating within them and with the goal to highlight their contribution to urban politics to come. In spite of their differences, the analysis discloses a common concern: the need to free urban space from ‘acceptable injustice’ considered as a pillar of the architecture of contemporary urbanisation. The meaning of city and the way of conceiving urbanisation have rapidly and profoundly changed in the last 30 years. After the economic decline of the 70s, a lengthy period of restructuring of urban life and urban politics has reshuffled conceptions, perceptions and imaginations of urban space and its possible dynamics of transformation. In spite of the many triumphalist descriptions on the achievements of these recent dynamics of urban transformations (Brenner and Schmid 2015), the economic crisis has revealed the environmental, economic, social and political unjust consequences of the ‘restyling’ of urban space: social polarisation, expulsions (Sassen 2014) gentrification, erasure of public space are some of them. The common source of these consequences has been described differently by different scholars. Some of them define it as neoliberalism (Brenner and Theodore 2002; Harvey 2005), others as free market liberalism, contemporary capitalism (Sassen 2014), late capitalism (Povinelli 2011) or as absolute capitalism (Ranciere in Confavreux 2016). In the following, I will use the expression neoliberalism which is defined as: “in the first instance, a theory of political, economic practices that proposes that human well-being can best be advanced by liberating individual entrepreneurial freedoms and skills within an institutional framework characterized by strong private property rights, free markets and free trade. The role of the state is to create and preserve an institutional framework appropriate to such practices” (Harvey 2005:2). However, independently from the specific definition of the current status of capitalism, these accounts identify the emergence of a dominant conception of urban space as a central place for capital accumulation (Harvey 2012). The Haussmannian idea of a city, although adapted to a flexible, immaterial and fluid economy (Sassen 2014), has been emphasised at the point that, currently, cities are recognised as the fundamental, if not the only, economic machine capable of assuring the reproduction of capital. A new set of urban planning practices and policies based on a disciplining managerialism (Harvey 2005) and a consensual style of governance (Swyngedouw 2010), often based on public–private partnerships, has assisted the free market economy to achieve a dominant position within cities. Even when enacted for erasing some causes of urban decay, or for the sake of sustainability and social inclusion, planning practices and policies, such as strategic plans and urban regeneration policies, have slowly injected the neoliberal ideology (Gunder 2010) which has produced the systematic deregulation (Peck 2013) and radical de-politicization (Swyngedouw 2010) of urban space. In the contemporary city, no longer seen as a contested space, the primary force shaping urban transformations is the law of supply and demand (Fezer 2010). Although this new set of neoliberal urban politics has been promoted, sustained and reported as fruitful and irresistible (Brenner and Schmid 2015), all over the world heterogeneous groups of citizens have mobilised to counter its unjust consequences. Sometimes considered as revolutionary beginnings of a new urban era or as expressions of contingent protests unable to adequately counter the neoliberal restructuring of urban space and scaling-up, the transformative and emancipatory potential of these collective actions remains contested (Monno 2014). Worse than this, the hope that collective action or even more or less radical planning and design practices might be able to steer urban development seems very unrealistic (Fezer 2010). Moving beyond such disputes, in this paper I focus on activism as the radical margin of the twenty-first century urbanity requiring attention, nurturing, recognition, and valorisation (Swyngedouw 2010). My concern is identifying its contribution to the construction of different urban politics for a different city and urbanity. For years, different theories of justice such as resources redistribution (Rawls 1971), recognition of difference (Young 1990), as well as radical approaches focusing on social and spatial injustices (Dikec 2001) and supporting, for example, the right to the city (Harvey 2008), have challenged and inspired discourses and practices on more just urban politics. However, these theories and approaches appear inadequate to define urban politics alternative to neoliberal ones (Connolly et al. 2009). From this point of view, the paper cope with the task “to initiate dialogue between urban activism and its analysis and thereby “to deepen collective understandings and define more adequate lines of action” (Harvey 2005: 199). Hence, I wonder if, despite its evident heterogeneity, progressive weakening and apparent inefficacy urban activism has scattered seeds for different urban politics. Inquiring into the sense and feeling of injustice circulating within citizen mobilisations is considered a good place to start. The paper consists of three parts. In the first, it highlights the difficulties in grasping the transformative potential of the new form of activism in the neoliberal city through existing interpretative framework. In the second part, it describes two cases of citizens’ mobilisation played out in southern Italy. Lastly, the paper identifies in the rejection of the ‘acceptable injustice’ (Monno 2014) a possible contribution of urban activism to urban politics to come. When observed in terms of transformative potential, the landscape of the recent wave of urban activism is a complex phenomenon and, hence, difficult to decipher. After the wave of the 60s, characterised by homogenous social movements, urban activism has undergone a continuous fragmentation, loss of social commitment and capacity to challenge oppressive forms of state and city (Mayer and Boudreau 2012). In particular, this trend worsened during the late 1990s and the early 2000s, as the neoliberal shift from government to governance proceeded. Several social movements and NGOs were co-opted or attuned their ideas to the neoliberal agendas, thus progressively losing their legitimacy as a critical voice capable of proposing alternatives to the status quo. Others became nonprofit organizations to provide social support, which was no longer available through the welfare state, to local communities (Mayer and Boudreau 2012). The recent wave of activism interrupted this discouraging process of implosion by experimenting new kinds of collective action and using a wide spectrum of unconventional forms of protests. By aggregating citizens of different economic and socio-cultural backgrounds, a myriad of ephemeral collective mobilisations have struggled to solve specific problems or gain a specific (humann, social or political) right at both the local and global scale. Whether preserving autonomy from or establishing hybrid relationships with public institutions (Monno 2014), as Butler (2015) and Butler et al. (2016) has noted, one of the fundamental characteristic of the recent wave of activism is the use of the body as a means to expose the extreme precariousness of our lives under the neoliberal restructuring of urban space. Deciphering the third wave of activism moving the focus of analysis from the plane of the understanding of its mechanism, dynamics of mobilisation and goals, to that of its transformative potential is a much more difficult task. On the one hand, citizen mobilisations have been reported as practices of radical democratization as they question the post-political and post-democratic consensus that governs our contemporary cities; they have raised issues concerning equality through inclusion and recognition (Swyngedouw 2010). Nevertheless, in lacking shared goals or alternative global imaginaries and a well-structured organisation, the new wave of activism seems to be ineffective in producing a meaningful change both in the short and in the long term. Their fragmentation, local dimension and focus on specific problems has relegated them to ephemeral apparitions of the contradictions of capitalism. On the other hand, urban activism played out at the neighbourhood or community level, or, which has emerged through global networks, has been reported as the seed of a possible profound change of neoliberal meaning of urban space. Collective actions are transformative in the everyday because they cope with local and particular social and cultural problems and hardship. Even when they are not intended to change the world, heterogeneous practices developing in small places provides the necessary energy to continuously change the meaning of urban space. Moving away from such dualism, and focusing on the vision of urban society that emerges from these practices, several studies have identified the distinctive character of the third wave of activism as a renewed need of community (Ranciere in Confavreux 2016) or, better, as a new culture of commons in opposition to the neoliberal individualisation of our lives (Laval and Dardot 2015). For other scholars, each of these interpretations reveal a piece of the puzzle. However, from their point of view, the heterogeneity of practices developed during the recent wave of activism requires a completely new set of categories of analysis. Drawing on existing notions of what radical practice and transformative potential should entail, well-established interpretative frames risk obscuring emerging political projects and imaginaries and distort the real goals of citizen mobilisation (Nicholls 2007; Uitermark et al. 2012). My research moves in this last direction. It is driven by Young (1990) insisting that we need to be involved in political activism to understand it. A couple of simple questions leads it. Can we recognise some affinities regarding the sense and the feeling of injustice circulating within heterogeneous forms of urban activism? And if this is the case, what contribution such a similar sense and feeling offer to urban politics of the future? The case studies described in the following paragraphs draw on different materials that I collected during some years spent interviewing activists, observing them during their activities as their activism changed, and walking with them while taking part to citizen mobilisations as an activist myself. In the following, I focus on the sense and feeling of injustice that I breathed during my encounters with activism by analysing the narratives circulating within them. Narratives are tools to explore experience and make sense of it (Bamberg 2012). Here, I have not the space to report extensively on the narratives recorded in my research materials. What follows is a very concise account of them. Taranto is a city of about 200,000 inhabitants by the Ionian Sea in Southern Italy (Apulia). Nowadays, it is well-known in my home country as the city of the “working or dying conflict” because of the close relationship between the unsustainable industrial pollution and a stable labour market. In the 60s, a steel plant was constructed in this city by means of the “Intervento Straordinario nel Mezzogiorno” as a way to trigger economic growth in the poor Southern Italian regions. Initially owned by the Italsider group, a state-holding industry, in the mid-90s, the steel plant was sold by the State to ILVA, a private group. Since the privatization, ILVA being one of the biggest and most polluting steel plant in Europe, the urban development of the city has been managed as a private space of negotiation among national and local professionals, economic-political elites including the steel plant owner. Due to the rise of globalisation, since the 70s, the city has experienced a continuous social, economic and environmental decline. Nevertheless, the local economy is still dependent on its steel production. Following the trend of neoliberalism worldwide, strategic plans, regeneration policies and programmes have tried to reinterpret the steel dependent industrial development path of Taranto. Some of the plans and policies have never been implemented. Others have not changed the status quo due to top down decision-making processes usually ignoring the causes of the social and environmental decline of the city and occurring in an institutional context dominated by political patronage. 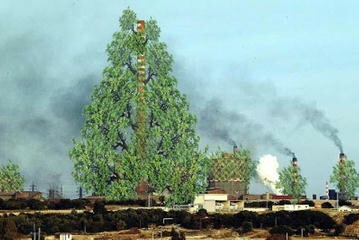 Until 2006, Taranto Sociale, a group of few environmentalists, repeatedly denounced the increasing pollution of local ecosystems produced by the steel plant. However, its focus on ecosystems protection was not able to penetrate the wall of silence and construct an environmental movement at the urban scale. Entrapped in “occupational disadvantage” and, hence, in the fear of unemployment following the steel plant closure, Taranto was a silent city. In 2005, a survey (unpublished) on perception of environmental risks in the city revealed that for Taranto citizens the risk of dying in a car accident was much higher than dying from cancer. In 2006, things changed. In order to strengthen the sustainability of its new energy policy, the Regional Government decided to construct two regasification plants, one of them to be localised in Taranto on a dismissed industrial site in between the steel plant and the ENI refinery. Unfortunately, the Regional Government did not involve citizens and NGOs in the decision making process. Worse still, the compulsory EIA (Environmental Impact Assessment) procedure was started without involving local population. Furthermore, as usually happens, the assessment did not detect any significant environmental impact or risk for the safety of the local population. For Taranto Sociale and others environmental NGOs, such a decision and assessment were unacceptable. The regasification plant would worsen the evident crisis of local ecosystems and strengthen the environmentally destructive existing industrial development shaping the city. It was quite usual to hear phrases like this: “Taranto citizens already pay a high price to the Nation because of its strategic position (both as a site for an important navy arsenal and the steel production). Therefore, they cannot consciously accept the localisation of another dangerous and unsustainable industrial activity”. Since the Regional Government ignored their protest, Taranto Sociale and the other NGOs decided to intervene in the EIA procedure. As stated in Italian law, they sent their comments to the National Environmental Department to object, and hopefully prevent, the construction of the regasification plant. Their determination to avoid another “environmental discrimination” triggered two parallel processes: on the one hand, the construction of a robust civic knowledge with the help of researchers and professionals, and, on the other, the construction of alliances and networks with an enlarged civil society beyond the city. To pursue these goals, in 2006 the Committee against the Regasification Plant was established. The Committee decided to focus on risks to human health and safety. Its studies and researches showed that any explosion occurring in the regasification plant would trigger a domino effect potentially producing an unsustainable diffusion of polluting agents and destroy a large part of the city. Its localisation would prevent a large number of citizens from escaping from urban area. The narrative of environmental discrimination and its focus on the risks for human safety changed the history of the city. Strengthened by an unexpected support by citizens and other local associations, the Committee started to acquire the necessary but missing data on the level of pollution in Taranto. This research on air and soil pollution showed the inhabitants of Taranto what they already knew but did not want to see: pollution and in particular dioxin contamination produced by the steel plan was beyond all tolerable thresholds. Having reframed and outlined the decline of the city as environmental injustice, an increasing number of associations and citizens joined the Committee against the regasification plant. At the same time, the environmental injustice perspective required the opening up a serious debate on future of the city to identify possible spatial politics which no longer assumed the acceptance of the steel production as their starting point. In 2007 the Committee against the regasification plant was transformed into the Committee for Taranto. Within the new Committee, different visions on how to counteract this environmental injustice coexisted. A small group of people proposed the immediate closure of the steel plant. Accordingly, they held a popular referendum on this topic. Another group supported an endogenous and yet diversified local development. Others thought that the renaissance of the city had to be still based on steel production as long as it was made sustainable by using the best available technologies. In spite of these differences, the need to break free from the conception of Taranto as an inevitable casualty of local and national economic growth had the effect of binding local population. In 2009, almost 20,000 people participate in a march organized by NGOs joining the Committe to claim Taranto citizens’ right to a healthy decent life. In the following years, the regasification plant project was dismissed, the European Union sanctioned the Italian Government for letting ILVA polluting the local environment. A new regional law was passed to reduce the acceptable threshold of air pollution in the Apulian Region. In 2012, a law-suit was taken against the owner of ILVA and local politicians, professionals, public administrators who were supposed to be responsible for the environmental disaster in Taranto. As foreseeable, the steel plant underwent a profound crisis raising again and again the fear of lack of employment. The workers started protesting to preserve their job and to avoid the closure of the steel plant. At the national level the apparent impossibility of finding any solution to Taranto as the site of environmental injustice was reconceptualised as a result of the “working or dying conflict”. Although grasping a relevant aspect underlying the crises in the city of Taranto, such a vision so strictly focused on economic parameters, closed again any opportunity to rethink radically the future transformation of the city. In 2013, the referendum to close ILVA did not get sufficient votes while the National government decided to continue the steel production in Taranto. ILVA would be ecologically modernised and sold to an international holding. Additionally, the cleaning up and regeneration of the city would be founded. Nowadays, when the future of the steel plant and the city is still uncertain, the steel production continue to pollute Taranto despite the cleaning up operation. The Committee for Taranto, increasingly less influential, is still there to inform citizens (Fig. 1). In Bari in 2002, a small group of women started working in a very deprived neighbourhood called Enziteto (nowadays San Pio) under TSEO (Territorial System for Equal Opportunities) a 3-year project (2002–2005) funded by the EU Equal initiative. The project aimed at introducing the disadvantaged women living in this neighbourhood into the labour market. By empowering each of them through the construction of their individual capacities, TSEO would enable these women to set up and manage two labour cooperatives. The ghettoisation of Enziteto neighbourhood, a public housing settlement built between the end of the 80s and the beginning of the 90s to provide a house for poor people who had to be moved from the old inner city in order to regenerate it, is the result of a top-down urban development ‘model’ based on the so-called brick-economy. As many others public peripheries, this settlement was situated far from the city, specifically 15 Km from the city centre. In 2004, the urban landscape in Enziteto was terrifying. The neighbourhood was marked by unemployment, violence and an aggressive criminality, the absence of a public social life, devastated or gated buildings and deserted streets. Its decay reflected the decay of the welfare state, the failure of public peripheries, patronage-led local practices of management of public goods and an unopposed control of the neighbourhood by local criminality. About three thousand people lived in it. Some of them occupied the public housing stock illegally, but under the protection of local criminality. At the same time, it also mirrored the emergence of urban regeneration policies as an area based practice of urban transformation potentially open to the production of highly differential values in the city. In fact, although available, the funds for regeneration had been mainly used by the municipal government to revitalise the old city. At the beginning of their participation in TESEO, illiterate women, housewives, low-paid temporary employed female workers, often complain “Living in Enziteto means having no rights…here you are born without rights”. However, as TSEO proceeded, they began to talk of a shared “dream”: “I want to change this neighbourhood! This is the opportunity!” “I don’t believe that I could get a job through this project, I am here to change Enziteto”. This dream implied at least three big changes in their lives: to stop thinking in a ‘good enough’ perspective; to construct a new image of the neighbourhood as a common good of the city; to institute an enlarged and yet autonomous community able to define new rules of coexistence. In a short time, this group of women brushed away the narrative of individual capacity underlying TSEO as a means to overcome their deprivation. For the women, thinking of them as being born without rights, the equal opportunity system appeared as a new illusion of a better life. “When we are here, we feel good… however our desperate lives are left at their own destiny”. Usual questions circulating in EW meetings were: What does justice mean? Why I am segregated? What could we do to see our denied rights, like joy and freedom, recognised? What kind of changes in the neighbourhood could avoid existing injustices and violence? How should local governments intervene to rethink our neighbourhood as part of the city in which we live? What kind of city we create everyday if we do not recognise and act upon such evident injustice? For them, their despair and urban politics for the neighbourhood and the city were the two sides of the same coin. Once broken the wall of acceptance entrapping their lives in a resigned despair they operatively acted on: (1) the requalification of the built environment; (2) the transformation “of unfair economic, social and political power relationships shaping the urban transformation and the everyday social injustices in this neighbourhood”; (3) the organisation of a stable and open “group of women representing a permanent challenge to local criminality and the silent public institutions”; (4) the creation of a collective life through the organisation of social events to revitalise both the public spaces and the public sphere both in the neighbourhood and the city; (5) the creation of a social centre supporting women in facing their everyday problems; (6) and the setup of an “agency for peripheries” managed by EW to support local government in the construction and implementation of more just urban politics. Through an incessant production of knowledge and reports on life in the neighbourhood they raised the outrage of many citizens in the city. The group become the epicentre for a wide network of politicians, planners, activists and intellectual struggling for a participatory, a fairer urban development. Many local politicians and intellectuals increasingly mentioned and involve EW in their political activities as a vital force capable of changing uneven urban politics. And yet, when involved in informal governance processes, the focus of some women changed. Their activism shifted from injustice to search of solutions to specific problems. This changed EW status: from being citizen and actors they become only problems for local governments. The Municipality changed the name of the neighbourhood, rehabilitated some social buildings, activated some basic local social services, and tried to alleviate some situations related to extreme poverty. This shift in their action pushed the EW to the edge of the new municipal political agenda and in their own private sphere in which they are unable to act. EW group faded away. None of the rehabilitation plans which they proposed to local governments has never been carried out. After a couple of years some of EW activists told me: “if only we hadn’t accept….If only we had continued to institute the agency for peripheries”. Although the two stories of activism are profoundly different, their possible contribution to urban politics to come has to do with their ability to mobilise citizens who feel that the activism under their scrutiny has something in common with the hardships of their everyday lives. This something is embedded in the activists’ narratives, as described in the above sections, and their being soaked with a sense that any tolerable threshold of the acceptance of injustice has been exceeded by what is going on in their home city. In Taranto and Bari, the neoliberalisation of the urban space intersected and accrued persisting and severe injustices while ignoring them. In particular, in Taranto, the implementation of energy policies based on privatisation of natural resources sanctioned the already existing use of the urban space as a market exclusively available for the bargaining of interests between political and economic actors. In Enziteto, the restructuring of deprivation as a matter of individual capacity, the latter being enacted through the equal opportunity system, justified existing practices of urban development based on the ghettoization of the many for the good of the few. In both cases, the pre-existing or future injustices were intentionally forgotten through the simple dictates of economic growth and competition. By showing the new risks to human safety associated with the regasification plant and a possible worsening of deprivation and poverty as a result of the individual capacity approach, studies and researches carried out by the Committee and EW showed that the new politics, including urban regeneration, would leave citizens exposed to further economic imbalances as well as environmental and social impacts, without any public support. The new politics of urban transformation replaced well-established (although contested) criteria of redistribution, compensation or negotiation of resources and possibilities of life. In their place, the new politics promoted the idea that any injustice produced by urban transformations could be accepted as long as citizens were provided with the opportunity of forgetting their despair, by “feeling good” in a new park or a regenerated public space-although temporarily. It was clear that the new urban politics would erase injustice and, simultaneously, instil a new idea into the city: that of injustice as a natural fact and, hence, as an acceptable phenomenon. This new consciousness spread an unusual feeling of necessity for insurgence among citizens. An insurgency against a new culture of urban transformation based on the acceptance of injustice as a natural fact, which induces citizens to “coexist with the tacit acceptance of many specific forms of inequality and with silent resistance to any practical steps to correct them” (Rosanvallon 2013). This broke up the wall of citizens’ passive consent to inequality and spurred citizens to join the activists’ mobilisations and activities. At the same time, activists both in Enziteto and Taranto deconstructed the culture of the acceptable injustice. A culture that erases the structural character of injustice from urban politics while at the same time limiting the possibility of acting on it. Thus, instead of bargaining with public institution over the acceptability of new health, environmental and poverty risks, activists continuously constructed new knowledge on the cause of the environmental crisis in Taranto, and deprivation in Bari and organised activities to contrast these phenomena. In doing this, they showed that acceptability is not a trustable variable to deal with issues concerning justice and injustice in urban politics. Acceptability depends on culture, knowledge and power relationships. Its conception changes in time, just as occurred in the case of the blind acceptance of unsustainable pollution in Taranto and segregation in Enziteto. Furthermore, the attempt to implement urban changes on the basis of negotiations concerning the acceptability of injustice is a trap. Acceptability is divisive. It cannot be constitutive of a community of equals as it erodes the sense of collective action and equality. In fact, it instils the idea that a wealthy and healthy society cannot avoid condemning one of its babies to be segregated and isolated in a “broom closet” and, hence, ignoring his/her existence for the good of a community (Povinelli 2011). In this last case, the economy of passive acceptance prevails over the troubled search for more just urban transformations. An economy which will always try to perforate and disaggregate the Committee and EW. At the same time, the Committee and EW trace a possible path to escape from the acceptability-trap by shifting the focus of their action from particular problems to the future of the city. Activists did not only refuse to assimilate the urban space to a dense urban environment governed by an ethic of free-exchange (Sassen 2014) and to be regulated by governance structures involving few actors that, in the best case scenario, act behind a veil of ignorance (Rawls 1971). They also proposed a different style of urban politics putting issues of equity and equality of places at their core. For activists in Taranto and Enziteto, equity and equality are not only a matter of recognition, inclusion and redistribution. By focusing on the future of the city, they try to institute a collective life producing more just urban transformation through the awareness of the crisis of existing theories of justice and injustice and their inadequacy in a socio-political context profoundly changed by neoliberalism (Rosanvallon 2013). For them, places matter in urban politics: learning from their different histories and geographies can help recognise injustices and cope with them from a collective point of view. They call for urban politics based on social learning that, by rejecting the acceptability of injustice, can also identify new ways to cope with issues concerning distribution of material and immaterial resources. Urban politics act at the border-line between justice and injustice (Uitermark et al. 2012). Within them, several theories of justice are supposed to work, thus ensuring some forms of compensation or redistribution. However, under neoliberalism, they have slowly been replaced by a new set of politics injecting a new free-market ethic based on systematic deregulation and the radical de-politicization of the urban space. Urban activism has been considered as a force potentially offering an alternative to this trend. Yet, the recent wave of urban activism does not seem to have produced meaningful changes to neoliberal urban transformation or offer an alternative urban imaginary to it. This paper, with its focus on urban politics and the sense and feeling of injustice circulating among activists, offers another, hopefully useful perspective. Urban activism matters because it questions the idea of justice underlying urban politics. In general, when observing urban activism, justice is taken for granted because it is assumed to be embedded in the protest itself (Dikec 2001), so that no further inquiries are necessary into this topic. On the contrary, the above case studies depict another scenario. Activists continuously deal with issues of spatial justice-injustice. Through their activities they unveil, deconstruct and re-signify the idea of injustice at the base of urban politics. The case studies analysed above warn about the dismissal of any concern for equity and equality in urban transformation and their substitution with a culture of the acceptability of injustice, which is currently taken for granted in the cities we live in. For activists, urban politics to come can still matter as long as they escape the acceptability trap, and restart working through the uncomfortable borderline between justice and injustice in relation to places. It is through a perspective of equity and equality and a social learning process based on the histories and geography of places that we can change or reinterpret the myriad of existing theories and criteria of justice or, better, discover new ones. And it could also be possible to change existing tools available to pursue spatial justice—even neoliberal ones such as economic incentives and compensations. The examined cases of activism seem to ask: why not consider escaping the acceptability-trap as a meaningful starting point of change? May we view this as a pillar of alternative urban politics to neoliberal ones?